So when my neuro says he wants me to start physical therapy, does that mean I’m going to hear a call from them or does that mean I’m supposed to go out and find my own? Just asking cause it was a week or so ago when he said this. Confused. My son starts (Lemtrada) infusions Monday. Can you guys give me an idea of what we’ll need to take with him to the infusion center? And what we’ll need to have ready at the hotel? Feeling anxious. I go for five days of (Lemtrada) infusions next week I’m terrified… Can someone help me with what to expect or if I need to prep or anything of that sort? Thank you. How can it be that patients are left dangling in the wind like this? Why is it so hard for some of our doctors to communicate with us? Or is it, in fact, the “us” that’s having a hard time communicating with our doctors? I just can’t fathom the question about physical therapy. How can any doctor suggest that a patient begin PT, but not provide a referral? (And, where it’s required, write a prescription) This isn’t something that should be left to a patient to figure out. Regarding Lemtrada, I regularly see complaints from patients about a lack of information in advance of their first series of infusions. It seems that many neurologists are unfamiliar with Lemtrada protocols and leave it up to the infusion center to brief the patient. Yet, it also seems that not all infusion centers are knowledgable about Lemtrada. Lemtrada is a complicated drug, and its protocol requires patients to obtain and take several other drugs before, during and following the infusions. 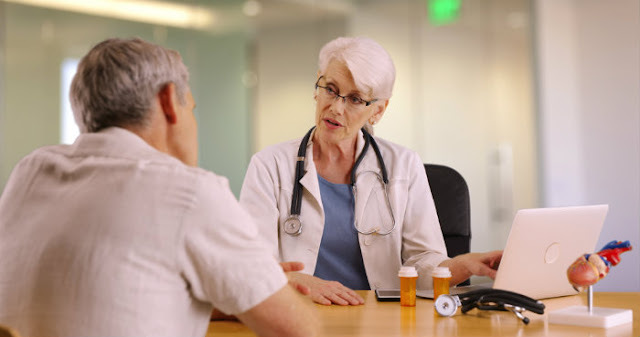 The drug’s manufacturer, Genzyme, provides a “One to One” support program for patients but, from my personal experience, it seems a bit overwhelmed. For example, my pre-infusion information “kit” didn’t arrive until a week after my infusions had ended. Fortunately, my own neurologist was great about providing information before, during and after my treatment. But, here’s something important. Information flow is not just the doctor’s responsibility. We, as patients, have a responsibility to ourselves to get the information we need. And that means being proactive about it and ready with questions before setting foot in the doctor’s office. The Agency for Health Research and Quality (the lead U.S. federal agency charged with improving the safety and quality of America’s healthcare system) has an excellent game-plan on its website to help you get the most from a visit with your doctor. It’s worth a look before your next appointment. The bottom line is, don’t be shy. Be prepared. You’re your own best patient advocate.